Are Americans Too Fat For The Bus? "The people on the bus go munch, munch munch..."
Federal bus safety rules are being rewritten for the first time since 1962. Why? Because our country has gotten F-A-T. Obesity is straight up out of control in our country, and overweight bus riders are putting everyone on the road at risk. Say what? The Federal Transit Authority (FTA) proposes raising the assumed average weight per bus passenger from 150 pounds to 175 pounds, which could mean that across the country, fewer people will be allowed on a city transit bus. The transit authority, which regulates how much weight a bus can carry, also proposes adding an additional quarter of a square foot of floor space per passenger. The changes are being sought “to acknowledge the expanding girth of the average passenger,” the agency says. Current federal guidelines on average passenger weight are based on surveys in 1960-62 of what Americans weighed then. Today, the Centers for Disease Control and Prevention says, the average weight is 194.7 pounds for men 20 and older and 164.7 pounds for women that age range. “FTA believes that 175 pounds is an appropriate average weight to assume for testing buses,” the agency says. Even with the changes, bus riders would be “lighter” than other passengers — at least by federal standards. The Federal Aviation Administration, which oversees airline travel, gauges average passenger weight at 190 pounds in the summer and 195 pounds in the winter. The Coast Guard’s assumed average weight is 185 pounds for boats and ferries. Hmm. If safety is the motivating concern here, we’re not sure that slimming these numbers down is doing anyone any favors. If the average American weighs 194 pounds, then policies should be crafted with that number in mind. America’s switch from skinny jeans to sweatpants influences gay men and lesbians in dramatically differing ways. Gay men are 50% less likely to be obese than their straight counterparts, while lesbians tend to be heavier than heterosexual women. After scrutinizing a health survey of more than 67,000 Massachusetts residents between the ages of 18 and 64, the researchers found that 14 percent of gay men were obese versus 21 percent of straight men. On the flip side, 26 percent were found to be obese, compared with 17 percent of the straight women. Women reportedly feel more pressure to be thin when they are with a male partner than another female, which makes a certain amount of sense to us. But ladies, let’s get it together here. The future of American transportation safety may depend on it! 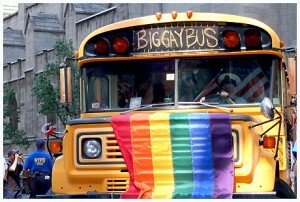 Are you surprised about the correlations between sexuality, weight, and transportation safety?